During “Dinner & A Dream,” former maternity patient Nicole Lynch, of Egg Harbor Township, right, spoke about the wonderful experience she had at Shore one year prior. Lynch singled out one nurse in particular, Nehal Bhatt, left, who was especially supportive during her experience. What do you get when you combine 25 talented ballerinas, one of Shakespeare’s most famous comedies, 160 guests and an inspiring program about maternity care? For Shore Medical Center, you get an outstanding event that raised $18,000 to support its maternity department. 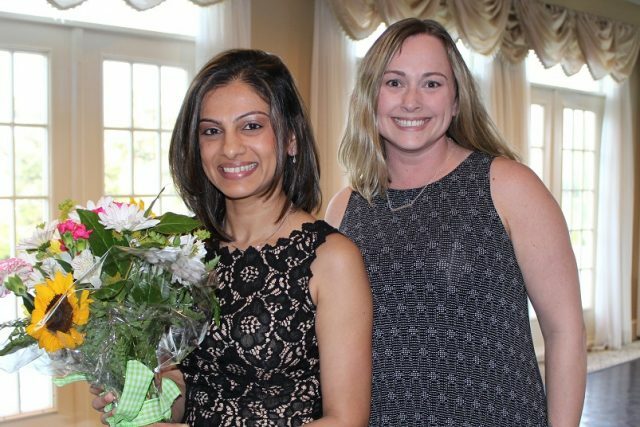 The event, “Dinner & A Dream”, was held Thursday, May 10 at Greate Bay Country Club and featured the Atlantic City Ballet’s live performance of Act I of Shakespeare’s “A Midsummer Night’s Dream”. Funds raised from the event will go toward Shore’s Campaign for Exceptional Births, which launched earlier this year with a goal of raising $100,000 to offset the expense of ten new fetal monitors. Fetal monitors are used throughout labor to measure a mother’s uterine contractions and her baby’s wellbeing. The new monitors will allow a mother to move around more easily and get out of bed while connected to the monitors, without compromising the accuracy of the measurements. During the program, Brenda Braun, clinical supervisor for Shore’s maternity and pediatrics departments, shared with the audience what makes Shore’s maternity department so special. “We have the most compassionate and skilled labor and delivery nurses at Shore who are so committed to giving each mom the best possible experience and birth outcome. With these new fetal monitors, our team will have the tools they need to make the experience for laboring mothers even more exceptional,” said Braun. Braun then invited former maternity patient Nicole Lynch to the podium, who spoke about her experience at Shore Medical Center nearly one year ago, and how one nurse in particular made her experience so special. The Atlantic City Ballet performed the first act of Shakespeare’s comedy, “A Midsummer Night’s Dream” at Shore’s “Dinner & A Dream” fundraiser for maternity care, held May 10 at Greate Bay Country Club. “I had a scare earlier in my pregnancy which required an overnight stay, and that’s when I met labor and delivery nurse Nehal Bhatt. As an older first-time mom, I was pretty scared, but Nehal stayed by my side holding the fetal monitor on me the whole time, comforting me and explaining what was going on. Then, when I arrived in labor four weeks before my due date, Nehal was once again there, which was so comforting,” Lynch said. Lynch then presented Bhatt with a bouquet of flowers as a token of gratitude for the difference she made. David Hughes, Shore’s chief financial offer and chief development officer, then announced to the crowd that Lynch and her husband, Bill Hansen, were supporting the campaign by requesting that guests to their daughter’s first birthday party make a donation to the Campaign for Exceptional Births in lieu of gifts. Finally, guests enjoyed a captivating hour-long performance by the Atlantic City Ballet, featuring ballerinas from around the world in full costume enacting part of Shakespeare’s comedy, “A Midsummer Night’s Dream.” At the conclusion of the performance, Founding Artistic Director Phyllis Papa made a timely announcement that one of their own ballerinas is pregnant, and that the evening’s performance would be her last until after her baby is born. The Atlantic City Ballet will be performing at two more fundraising events hosted by Shore Medical Center. On Oct. 5, Shore’s “A Cause to Celebrate” black-tie optional gala returns to the Golden Nugget Casino in Atlantic City. Gala attendees will enjoy a performance of “Carmen” by the Atlantic City Ballet, with music performed by the Tamara deMent Gillece Quintet. The ballet and the live sounds of the violin, vibraphone, piano, upright bass and drums will add a level of sophistication to an already elegant evening. Tickets to “A Cause to Celebrate” are $250 per person, with proceeds benefitting Shore’s Cancer Center. The third event will be held on Wednesday, Dec. 5 at the annual “Tree of Lights” celebration. “Tree of Lights” is hosted by The Auxiliary of Shore Medical Center, and offers an opportunity for people to commemorate their loved ones in the Tree of Lights book with a memorial or honorary donation. The Atlantic City Ballet will offer a free performance in the lobby of Shore Medical Center as part of the ceremony. To learn more about the Campaign for Exceptional Births and to make a donation to help Shore reach its $100,000 goal, please visit www.shoremedicalcenter.org/campaign-exceptional-births, or call the Planned Giving and Development Department at 609-653-3800.